The Tokyo-based Marine Journalists Conference has decided to present the 2013 MJC Marine Award (Cultural and Dissemination Section) to Itoman traditional sabani boat-builder Kiyoshi Oshiro. For many years, 63 year-old Oshiro has made fishing boats known as sabani and has contributed to expanding their use in the fishing town of Itoman. The conference is organized by journalists and editors-in-chief of magazines that specialize in marine sports, and the award is for individuals and groups that have made significant contributions in the field of water sports and leisure activities. 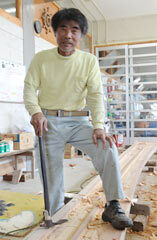 Oshiro is the fourth person from Okinawa to win the award. The awards ceremony will be held on March 9, in Yokohama. In explaining the reasons behind the award, conference representatives praised Oshiro for his contribution to Itoman by inheriting the methods of building, paddling and sailing traditional sabani. As the number of sabani builders has decreased through the years, he passed on his skills to his apprentice, Kazuaki Takara. By taking part in races, Oshiro has also displayed his own navigation skills and the superior performance of his boats. Oshiro learned the basic methods of making a sabani after graduating from junior high school. Despite the demand for these boats having almost disappeared due to advances in shipbuilding technology, he has continued to pass on the skills required for sabani building, while at the same time working in a boat repair business. Through the years, he has built a total of about 80 sabani.